Grateful thanks to Cal Allen and Thomas Johansen for generously allowing me to incorporate the fruits of their research into Oman revenues. Thanks also to Carmel Axiaq for providing printing details of the elusive first issue (R1/4). Note: Stamps issued by Ghorfa (The Arab-German Chamber of Commerce and Industry), formerly listed on this page, can now be found under Euro-Arab Chambers of Commerce. 1983-86 (recorded usage). Issue for Seeb (Muscat) Airport. Inscribed Seeb International Airport Passenger Service Charge in English and Arabic, with currency shown as R.O. (=Rial Omani). Imperf three sides, perf 10½ at left. No watermark. Serial number in both Western and Arabic numerals. Security background of wavy lines in blue. Recorded usage: 1983 (A1), 1986 (A2). c1930. Palm trees surrounding Arabic inscription State of Muscat and Oman, with Revenue in Arabic at top and in English at foot. 37x36½ mm. Perf 11, one or two sides sometimes imperf. No watermark. Note: Hardly any examples of R1/4 are known other than in a private document archive belonging to a family in Oman. A fifth value in black (illustrated at right) has also been recorded, though the image is insufficiently clear to confirm the value, which might be 3 rupees or 30 baiza (=2½ annas). _c1945 (based on Arabic inscription 1365 AH, which equates to 1945-46 AD). Fort Al Jalali, Muscat. Inscribed Sultanate of Muscat and Oman in upper central banner. 17½ x 22 mm (2a and 1r) or 24 x 30½ mm (5r and 20r). Perf 11. No watermark. 1. The 2 anna (which is inscribed one-eighth rupee) and 5 rupee values are currently known only as imperforate proofs in complete sheets (of 20 and 16 respectively), and it is not known whether they were ever issued. 2. The example of R13a illustrated above right is also imperforate between the right-hand stamp and the margin. Note: the stamps illustrated above are a previously unrecorded type printed by Waterlow & Sons. The design includes the Omani coat of arms at bottom left, and is inscribed at foot with the name Dhofar, a region of Oman which at certain periods of history was governed as a separate political entity. 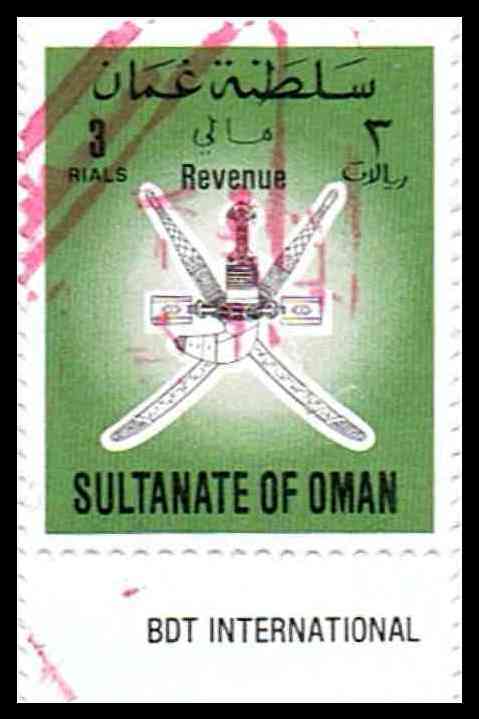 The stamps shown are denominated ½r, 1r, 2r, 3r and 5r, the currency being in rials. I do not know whether these stamps were ever issued, and would be glad to hear from any reader who can supply any further information about these stamps. I am grateful to John Copeland for sending me the above images. c1962 (based on Arabic inscription 1382 AH = 1962-63 AD). Fort Al Jalali, Muscat. 23½ x 30 mm. Perf 13½ x 13. No watermark. Note: according to Barefoot, R21/23 were issued in 1962, with R26 added in 1963. 1972-74. Arms of the Sultanate on a floral background, inscribed Sultanate of Oman in English and Arabic. 19 x 25 mm (50b) or 23 x 28 mm (others). Perf 14½. Wmk spiral crown CA (sideways on 100b and above). Printed (litho) by Harrisons in sheets of 50. Arms and inscriptions in black; background colours given below. 1. The dates of issue are known from the sets of proofs which are housed in the British Library. The first issue consisted of the set to the 1r. This was approved in May 1972, and would have been issued later that year. A new printing of four additional values (1½r, 3r, 10r and 50r) was approved in October 1974, and probably came out by the end of 1974. The date of issue of the 5r is not known. The proofs also show Harrisons as the printers and a sheet size of 50, though the format is not known. I have not seen issued examples of these stamps but it is very likely they exist. Numbers have been set aside in this listing for their future addition. 3. Barefoot lists a 4r yellow. I have not seen this value from this series though it may be an erroneous listing for my R58 below. 1989 (according to Barefoot). Similar to previous issue but redrawn with Revenue in slightly taller letters, and without the floral background. All values 22½ x 28 mm (no smaller format for low values). Perf 14¼. No wmk. Printed by BDT International (imprint in lower margin). Arms and inscriptions in black; background colours given below. 1998 (earliest recorded usage). Design again redrawn, with the English inscriptions at top in taller thinner letters as illustrated at right. Perf 13. No wmk. Arms and inscriptions in black; background colours given below. 1. The unit of currency on R71/72 and R83/84 is now correctly shown in English as baisa, not baiza as on the previous two issues. 2. Earliest recorded usage (smaller format): 1998 (100b), 2000 (200b, 5r). The document illustrated below shows a receipt for 200b fees paid in three stages on 22nd February, 8th March and 22nd March 1998. The first two payments use stamps of the previous series (my R51/2), while the third shows the earliest usage of R71. From this I infer that R71 - and possibly other values of this set - were issued in mid-March 1998. 3. Earliest recorded usage (larger format): September 2011 (5r).